Meg Black, a lifelong horsewoman and USHJA certified trainer, has been instructing riders for 30 years, starting her career at by teaching at Oldfields School, assisting the director at Garrison Forest School, and finally directing the program at Linden Hall School in Lititz, PA before settling in Maine. 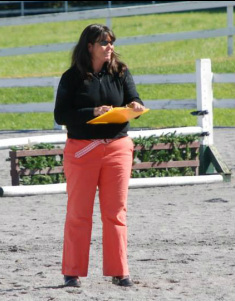 In addition to teaching and riding, she is a USEF licensed "R" Hunter judge, maintaining a busy officiating schedule, is on the board of both the Maine Horse Council and the Maine Hunter/Jumper Association. Lessons are $65/rider; $5 additional if using a lesson horse.